Help Kinetika set the Kitchen Table! Can you sew and do you love textiles? Are music, dance and drama your passion? If you can answer yes to any of these, then Kinetika invites you to join free, creative workshops and activities this summer as part of its Kitchen Table and T100 Recipes projects. 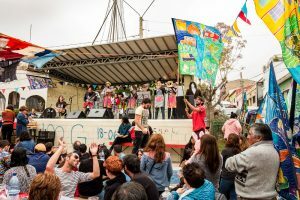 Teatro Container, a theatre company from Chile, on their UK premier tour, will be working with the local community to create a celebratory feast in La Cocina Publica, the Public Kitchen, at Tilbury Cruise Terminal on 21 July. Can you help us get ready to serve the feast? Volunteer stewards needed for all walks across Thurrock, Southend, Dartford, Gravesend. Come and walk with us! 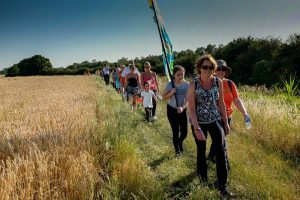 Walk stewards needed to support our walk leaders for a range of easy daytime and evening walks of various lengths, taking in markets, nature reserves and strolls along the estuary. Our walks this year look at the rich food variety in the areas we cover and there will opportunities to share and taste along the way. Do you have a song to share or a tale to perform? Can you help make bunting or do you have a special recipe you’d like to share? Musicians/ singers/ performers – more info HERE. Cooks/ bunting makers – more info HERE. We need YOUR recipes, YOUR stories, YOUR sewing skills and entertainment talents! This is your community and your feast – what do you want it to look and sound like? What do you want the food to taste like? Help welcome our guests from Chile and share your recipes, stories and songs to create a community feast to remember! You’ll meet the international theatre group Teatro Container and together devise the music, food and decorations that will shape the community feast on 21 July. Sat 14 July (6-8pm) Musicians and singers – Get together over a beer to share music and songs and devise a community performance. Wed 18 July (10am-1pm) Drama/performance – have a tale to tell, or a performance to share? Come to collaborate and see how you can be part of the final celebration. Thurs 19 July (10am-1pm) La Cocina Publica rehearsal – it all comes together – music, performance, cooking and textiles! Places are going fast so book your spot soon!